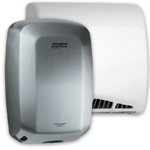 Variable Speed Hand Dryers use new technology in the hand dryer industry to lower noise and energy usage. 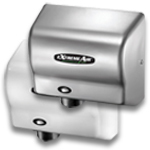 Since the Saniflow Speedflow hand dryer is surface mounted and only 4" thick, it is ADA compliant out of the box; no need to add a recess kit. This allow the Speedflow hand dryer to be installed without modifying the the surface of the wall. And the Speedflows are variable speed hand dryers so if the noise is to high for the surrounding, the speed can be reduced to low the noise level. The variable speed hand dryers manufactured by World Dryer Corp. provide a low power option at 800 watts and can dry hands in only 10 seconds. 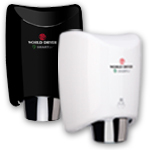 World Dryer also offer a recess kit to make the SMARTdri hand dryer ADA complient.